"How to awaken in us the courage of mercy? " In recent months, a Taizé brother visited several Asian countries during a long journey - here he writes about his stay in Japan. In Japan, I first visited Michio, who was a volunteer in Taizé at the time of the tsunami. Since returning home, he is responsible for the Caritas base in one of the areas affected by the tsunami. The earthquake took place five years ago, volunteers are scarce and there is a risk of forgetting. Yet there is still work for many years. I spent all day Sunday in temporary homes with very isolated senior citizens. Some were able to rebuild their homes, but not in the same place in order to protect them from another possible tsunami. Everywhere people are working, repairing roads, bridges, cutting off the top of mountains and using the rocks to raise the ground level. 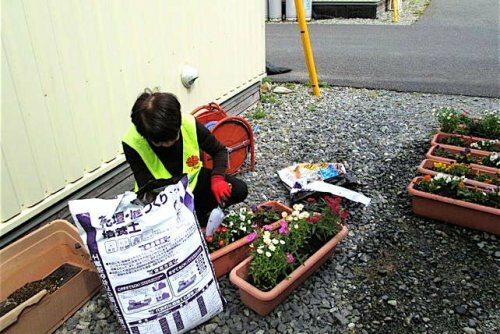 In temporary houses, planting flowers in tubs offered a small gesture of reconciliation between children and the elderly. At the same time, it was a way to have a creative activity with them. It was lovely to go to the market to buy flowers, bring them to the temporary houses, spend time with these people. Then I went into the Fukushima region to visit Ryousen, a pastor of the United Church. He was a volunteer in Taizé when brothers were still living in Japan. He was called to take charge of a small church in this very rural region, in the forest. He is also in charge of a kindergarten. The birth rate in Japan has fallen dramatically, and some kindergartens are closing. That of Ryousen however, located in a rural area, welcomes hundreds of children. Although it is 80 kilometers from the nuclear plant, there is a radioactivity counter in the school. In the village, you see spaces covered with plastic bags containing radioactive earth that they do not know what to do with. In these situations, the question that Brother Alois asks at the end of his introduction to “proposals 2016" is very actual: "How to awaken in us the courage of mercy, compassion, perseverance in solidarity?" 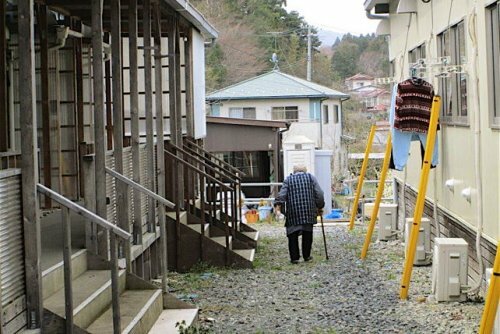 Prayer is certainly one answer: in Yonekawa, with those who wish, Michio prays faithfully every morning before leaving for work. Another example is the large number of youth and adults who came to pray with the Sisters of the Child Jesus in Yotsuya. For this reason also, a day of retreat with leaders of regular prayers was organized in Tokyo. An earthquake as strong as that in 2011 occurred in Kumamoto, the region where I was going. Again gestures of solidarity appeared everywhere; and again I wondered how to support these impulses which seem so ridiculously small given the scale of the disaster. The prayers that were held in Nagasaki, at Sophia University, and with students of a large school in Yokohama allowed us to entrust to God’s mercy the victims of this latest natural disaster and their families. Another answer is to take time to reflect together in depth about this question. In a small Anglican church in Ikebukuro (Tokyo), a group of young people who have attended European or Asian meetings could share in a lucid and realistic way. Finally, listening to the Word of God liberates unsuspected energies. During a day of retreat with students from the university of Kwansei Gakuin, there was a reading of the parable of the Good Samaritan using the Icon of Mercy that is in the Church of Reconciliation in Taizé. Six groups were formed, each was asked to find the relevance of one of six medallions of the icon. Then through a mime, each group shared its thoughts. These mimes opened everyone’s eyes to everyday life situations. They put a finger on our resistances and our fears, but showed that by overcoming them it was possible for each of us to be a good Samaritan. In Tokyo, the office that is organizing the journey to "World Youth Day" was very interested in the 2016 proposals and hopes to use them to prepare spiritually the young Japanese who are going to Krakow.